This past weekend I tried for the first time my brand new ZimmerBuilt Sling pack lite -- and I loved it. 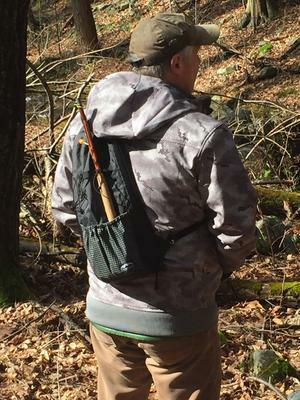 Previously I had been using a large and bulky waist pack that held a lot of gear (most unnecessary) which I had to completely remove to gain access to, or just take off when I found a spot to fish and leave on the bank. Not so with the Sling Lite. In fact, I never took it off all day. Besides almost forgetting I was wearing it, I simply unhooked one strap, swung it around to get what I needed, and flipped it back. I could even remove and replace my rod this way. I picked the Lite for a reason: I wanted to force myself to just bring the basics which the pack did admirably. But I could in a pinch stuff a shell or fleece inside if I needed to. The trip this weekend required quite a bit of scrambling up and down banks and having both hands free (the beauty of a tenkara rod) and a very slim pack behind me was a tremendous benefit. I highly recommend it. Although a bit expensive, this is a piece of gear your grandkids will use some day. Footnote: I also used for the first time the Nakazima Ball Floats. I've used every indicator in the world and these were best by far: easy to see, easy to re-locate, easy on the tippet. The Zimmerbuilt Guide Sling and Sling Lite packs are tough to beat. I've used my Guide Sling for 3 years now, fishing steadily, and it's as good as the day I first strapped it on. Top-notch stitching, quality materials, and thoughtful design make for a great combination. For tenkara day trips, I just don't know of better packs. Thanks for the great report. I can't believe how handy the ZimmerBuilt Tenkara Sling Lite Pack is. I rarely leave home without it! You never know when you might have the chance to wet the line for even 10 minutes. Mine is out in the SUV right now ready for 10 minutes of action or all day action. As John said, it is an investment, not something that is going to have to be replaced in a couple of years. I’ve fished a couple times with my new sling lite and completely agree with the above posters regarding its utility. It’s a great piece of gear! I’m wondering if folks are attaching a net to the sling, and if so, how are they doing it? I use one of the collapsible nets that Chris used to sell. I didn't see them listed on the site. It slides on to the strap. I then use a retractable line attached to the end of the net clipped to the strap so if I drop the net, it won't float away. It makes for a nice compact set-up.